Increase oven temperature to 425 degrees. Place wire rack inside aluminum foil lined rimmed baking sheet and coat with vegetable oil spray. Trim ¼ inch slice off bottom and both ends of each potato. Place each potato on cut base, place chopstick snugly on either side, and cut into fan by slicing potato crosswise at ¼ inch intervals, leaving bottom ¼ inch intact. Gently rinse potato fans under cold running water, and then let drain. (Potato fans can be covered with water and refrigerated for up to 1 day; drain before proceeding). Working with half of potatoes at once, place them, sliced side down, on large plate and microwave until slightly soft, 6 to 12 minutes, flipping them halfway through cooking. Brush potatoes thoroughly with oil (skin and flesh) and season with salt and pepper. 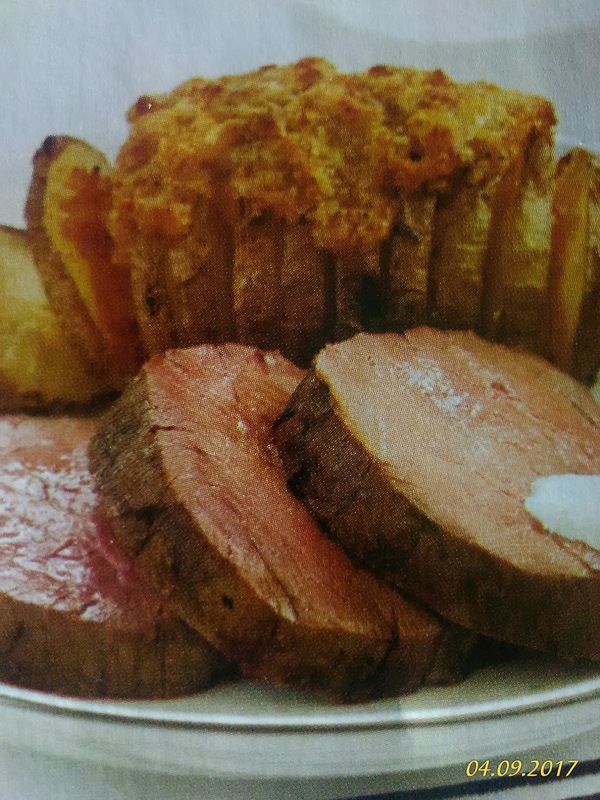 Roast until beef registers 120 to 125 degrees (for medium rare), skin of potatoes is crisp, and potatoes are beginning to brown, 45 to 60 minutes. Remove from oven. Transfer roast to carving board and let rest for 20 minutes. Meanwhile, adjust oven rack 9 inches from broiler element and heat broiler. Top potatoes with bread crumb mixture, pressing gently to adhere. Return potatoes to oven and broil until topping is deep golden brown, about 3 minutes. Remove potatoes from oven and tent loosely with foil. Remove twine and cut meat crosswise into ½ inch thick slices. Serve with potatoes. Mix all ingredients together in serving bowl. Season with additional horseradish, salt, and pepper to taste. 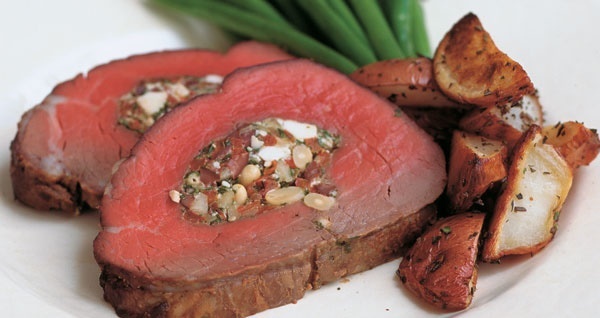 Cover with plastic wrap and refrigerate for 30 minutes before serving. End.